We celebrate Christmas in our house. And boy do we gear up for it. The weekend after Thanksgiving we get a tree (a fir, cut from the tree farm down the road) shove into the van and set it up. 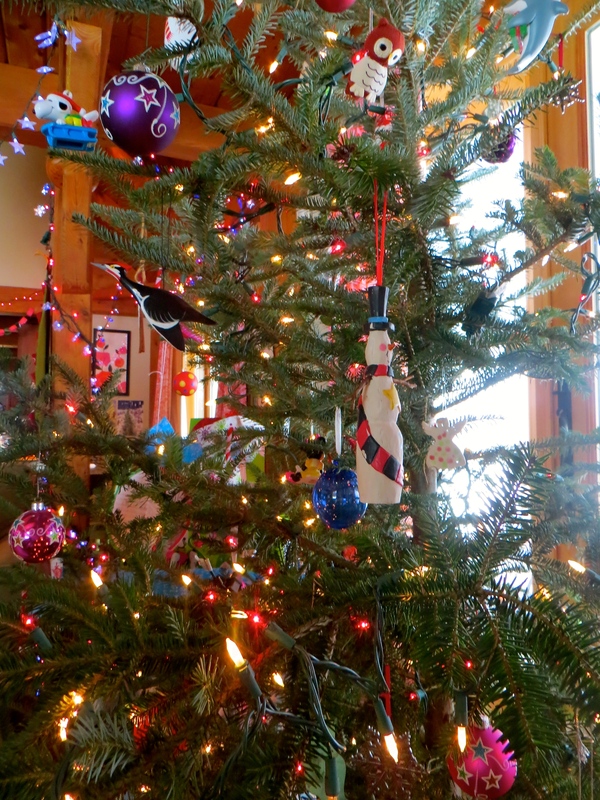 By December 1st we have a trimmed tree, lights up, holiday themed dishware out on the table and more to come. By Christmas Eve, we are ready to go–gifts wrapped, holiday music playing, a full refrigerator, stockings hung, festive as can be. So by Christmas morning the anticipation is pretty high. We spent the tail end of Christmas Eve at my sister-in-law’s place and so did not get home until later than the usual bedtime. Not that it mattered. Our kids were so excited that they had a hard time falling asleep. My son did not fall asleep until at least 11:00. He woke up around 4:00. He had the crazy idea that 4:00 was the time to get up and head downstairs. We had to put him off until 5:00. It was an early morning. 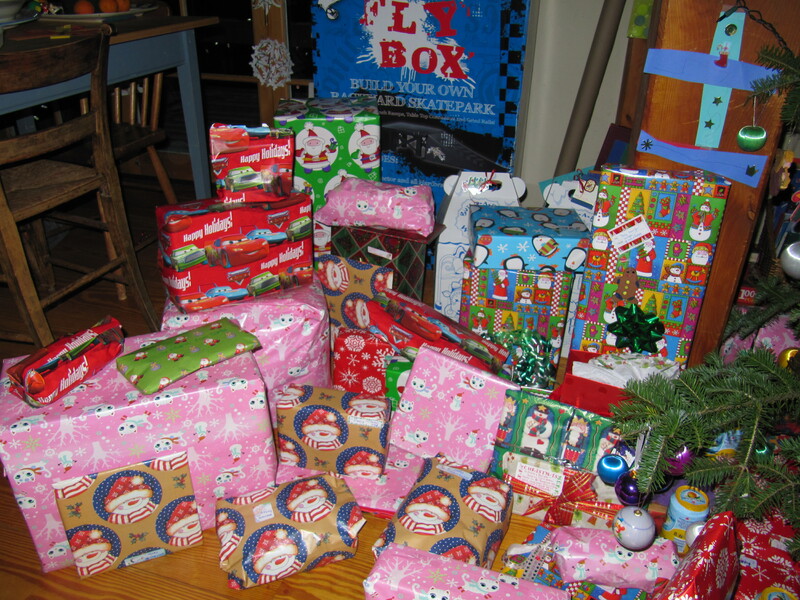 We had stockings stuffed with small gifts and opened those gifts first. We took a break for a waffle breakfast. We had a fire in the woodstove that heated things up fast–temperatures were in the forties. Some snow stayed on the ground at least. We had a lot of snow but then had two days of rain to wash most of it away. It was patchy Christmas morning but it was there at least. We opened gifts throughout the morning and early afternoon, trying to make it last. It is a pretty special day. I took a short walk after our afternoon dinner. The breeze felt warm and clouds drifted across the gray sky. The water in the river was high with all the melted snow. Fields were flooded. 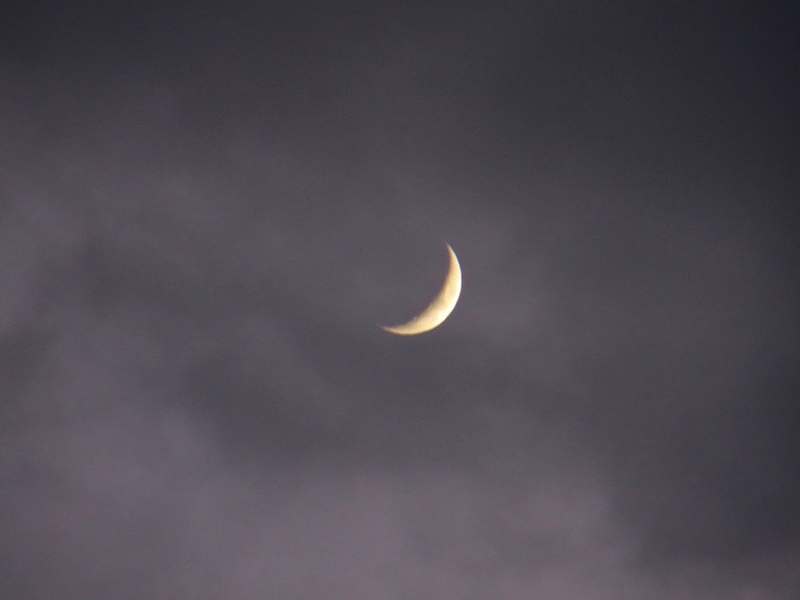 A crescent moon dangled behind the clouds. The road was muddy. It was quiet. I thought about how this day is about giving and love and it made me want to simplify my life, get to what matters most more often. The kids were asleep early. 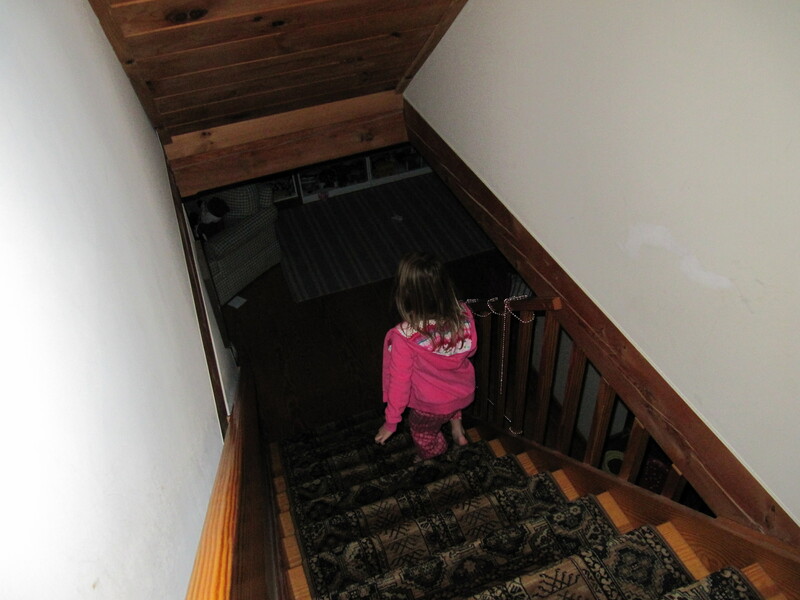 My daughter resisted the idea of going to bed earlier than usual, but she conked out pretty much immediately. My wife and I stayed up for a while, enjoying the quiet and the lights. We felt like successful parents, fostering the joy of the day, creating memories and all that. It turned out to be magical for all of us. After we turned out the lights and said goodnight to the tree, we headed to bed. It didn’t take long for us to conk out ourselves. We had a classic Christmas here at our house. Our children were pumped up on treats and gifts. As it should be. Santa came in the night and did his thing. We all benefited from his visit. The parents were awake (5:30) before the youngsters (6:00 for one, 7:00 for the other) and we got started early. Snow showers fell during the critical morning hours to lend to the air of Christmas, but it was warm enough for some icy outdoor play after lunch. In the afternoon, both my wife and I even managed to fit in a run on this not quite frozen day. 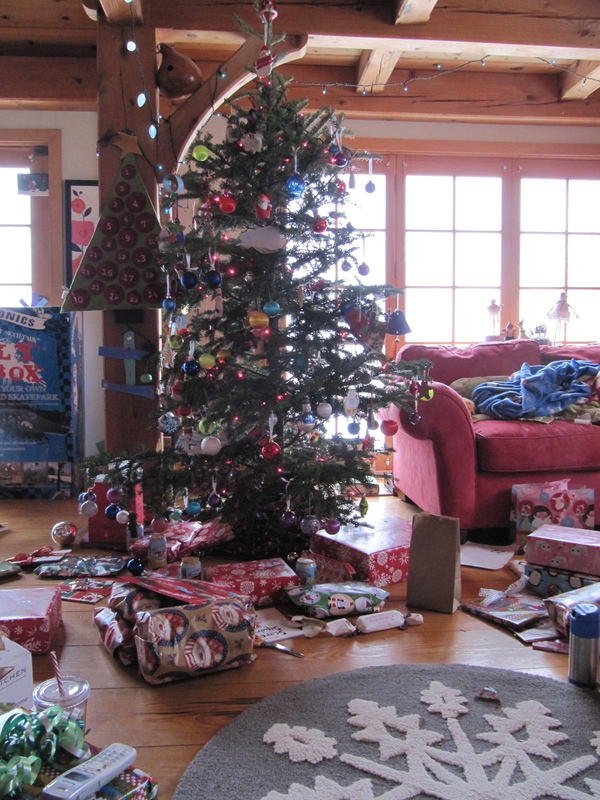 The kids opened gifts all morning. We tried to keep it going slowly. We did not stick to the one-at-a-time everyone-goes-in-turn method employed when I grew up. We will do that in time, but it just feels wrong to keep small children from enjoying the thrill of unwrapping. By request, we had pizza for lunch. We had out usual dinner of mashed potatoes, stuffing, cranberry sauce, peas and roasted maple butternut squash. That went down just fine. I realized that I did not have any candy until I had a half dozen M&M’s as I was making dinner. I did, however, have a vanilla Coke. My daughter was so tuckered from going to bed late, rising early, and playing hard all day, that she was asleep by about 5:30. Her brother followed about an hour later. They couldn’t have had a better time. They don’t usually squabble, but had nary a disagreement all day. Maybe we need to do this every day.